You know, it's the same old story. The month is not over yet but you have already spent way too much in records. You promise to yourself that you're not going to buy another record or two 'till the new month starts. Then, suddenly, you got offered something you want badly. In mint conditions. For a bargain, too. If there's something I've learned over many years of record collecting is that if you want it, the price is ok and you have the money, just go for it. Otherwise, you'll regret it forever. I've made the error of not buying a record only 'coz I had already burnt my monthly record budget so many times in the past. And everytime I think again about a certain record that I could already own, all I want to do is to crush my nuts with a hammer for having been so dumb. Remember, certain records won't cross your path again so easily. 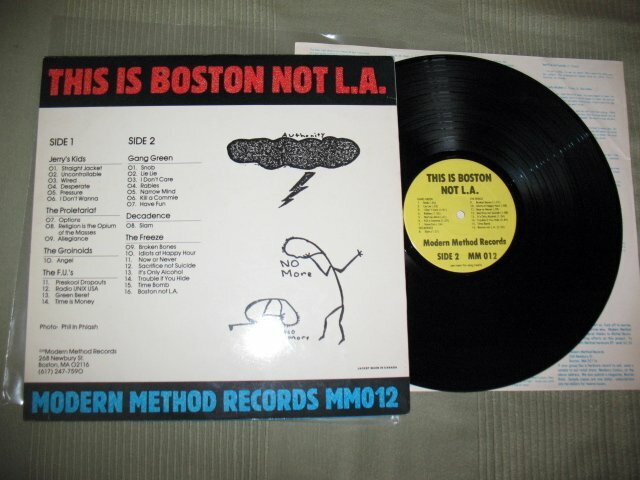 The legendary "This Is Boston Not L.A." compilation lp released by Modern Method Records back in 1982. Second press (first has blue labels). Top conditions. This is my probably my favourite comp. ever. Definitely the best outta U$ofA. The most amazing thing is that, even skipping big names like SSD, DYS and Negative FX, it still remains a damn solid release. 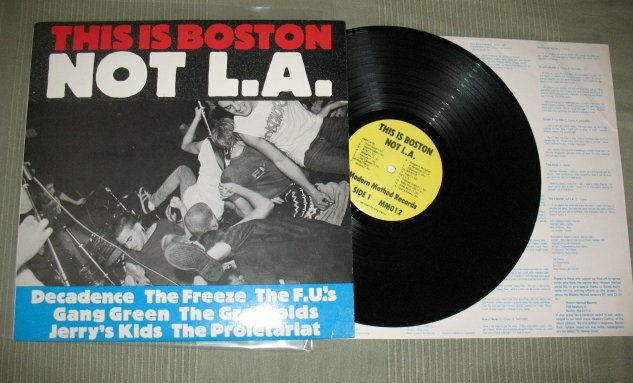 Well, I've always preferred the not-sXe bands from the Boston early scene, so this comp. is simply perfect in my eyes. Just think about the Freeze, FU's and Jerry's Kids material featured here. Not to mention Gang Green, the real winner here with their best tracks ever! Ok, I know it's not "all killer no filler" since there are a couple of mediocre bands but thanx shiva the best bands here are the one with more songs. For being a 30 years old record, it still sounds incredibly fresh and energic. But I'm talking about an undisputed classic, so you already know it! Of course there are way more important compilation out there that could have made it in this list (Flex Your Head or Thrash Till Death just to say a couple of names), but these are the ones that mean most to me. So here's my list, what's yours?